Argentina Rally: Ma. Ma. Sa. Image 2: First run out for the Violet GT. Andy Dawson and Jon Lloyd watch over service in Monte Carlo. The story of the Datsun Violet GT starts as long ago as Easter last year when teams lines up for the start of the 1980 Safari Rally. 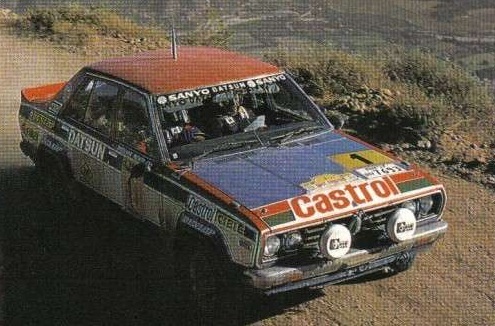 Japanese insistence on rallying cars close to standard specification brought the Datsun 160J to full competitiveness. 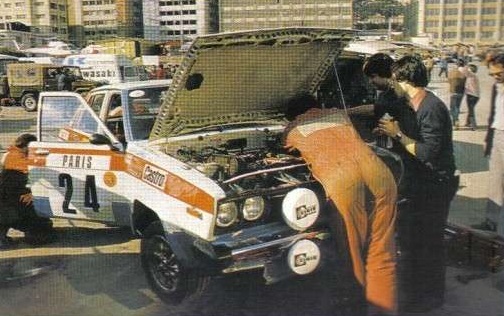 In Group 2 trim the car had won the 1979 Safari Rally. But, times were changing and even the Japanese had to admit that they now needed a more powerful, Group 4 version of the car. Datsun made no secret of the fact that they were trying to homologate a twin-cam version of the I60J. 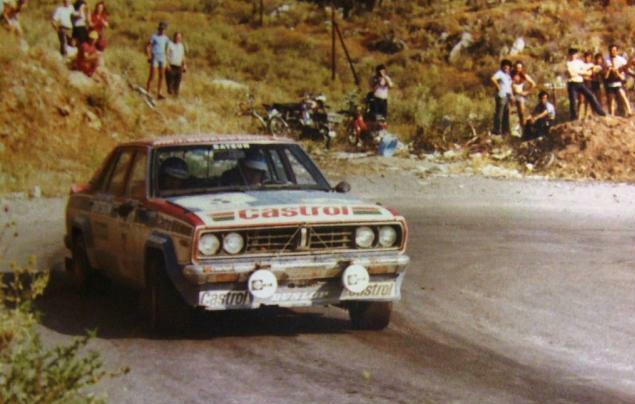 They even prepared two rally cars with twin-cam engines. Then, just before the start, came the news that the application had been rejected. Overnight the cars were converted back to group 2 specification and Shrkhar Mehta went on to score a historic victory. Questions were asked. Was there a new re powerful car after all? If Datsun would continue to win the Safari Rally, did they intend to invest cash in a new car? When the new car finally appeared at the Hart of the Monte Carlo Rally in Paris, it might have been assumed that the Japanese had simply re-applied for homologation of the 160J. Nothing could be further from the truth. In the intervening nine months the Japanese had learnt from their mistakes and had gone back to basics. The Datsun Violet GT. for all is similarities, is not simply a twin-cam version of the 160J. The homologation papers show it to be a variant of a Violet Coupe GT which was first accepted back in January 1980. The rules under which cars arc homologated by FISA in Paris are extremely complicated and, for that that very reason, open to liberal interpretation. The European based car manufacturers have long used the rules to suit their own aims. The Japanese, traditionally, have been scrupulously honest. 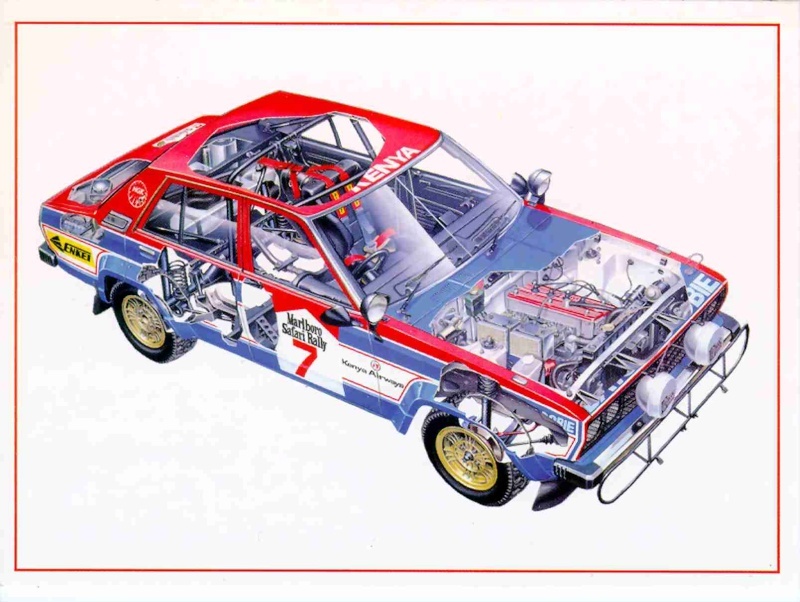 But, faced with increasingly powerful opposition, both Datsuns, and their arch rivals, Toyota, decided that they too would have to jump on the Group 4 bandwagon. Under the homologation regulations, manufacturers are allowed ‘variants'; that is changes in specification from a base model to suit local production needs. The 1800cc, ‘South American’ engined Talbot must be built in quantities of at least 541 cars in twelve months and the performance of the variant must not be an improvement over a base car. A number of other items must remain constant. The first variant to the basic Violet Coupe GT was a four-door. 'American bumper' bodyshell, accepted at the same time as the basic car. In December 1980 came a new variant, a twin-cam cylinder head with four valves per cylinder. 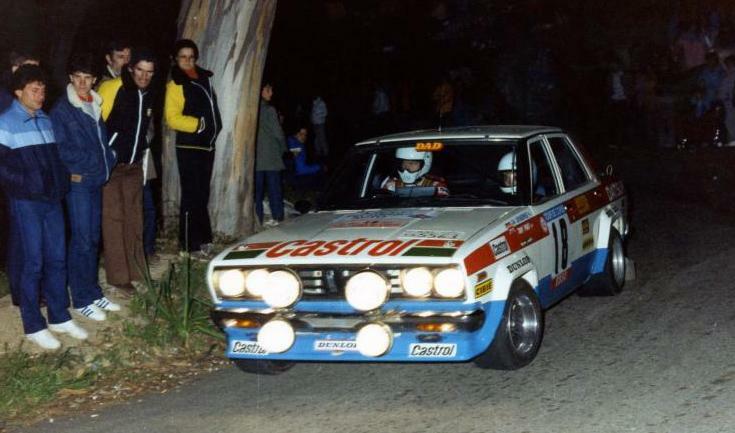 Datsun had the rally car that they had always wanted. Since then one other variant has been added the 'Four door sedan short bumper’ model as it is referred to in the papers. This was accepted in April 1981. Since under the current regulations, carburetor sizes and compression ratios are free, it is quite easy to design a variant which, despite its cylinder head, will still not outperform the basic car. The debut of the Violet GT was not spectacular. Rauno Aaltonen was chosen as the driver for the Monte Carlo Rally, more for his testing expertise than for his competitiveness (these days at least) on European style, special stage events. A steady run resulted in a placing outside the top ten. Timo Salonen drove a G4 car on the Portugal Rally but retired with engine problems and it was left Datsun stalwart, Shekhar Mehta, to get the first result in controversial win on the Safari. The team will not need to be reminded that a second Violet GT finished in second place, in the hands of Rauno Aaltonen. Clashes between Mehta and Aaltonen resulted in the two team-mates protesting against each other and the fail effect of the win, and the hat-trick, were lost. Since then Timo Salonen and Shekhar Mehta have done the bulk of the driving, with Tonv Pond scoring a fine third on the Tour de Corse by way of variation. Mehta finished second on the Codasur and retired in Brazil. Salonen will be competing this coining weekend on the 1000 Lakes Rally in his home country. Development of the Violet GT has taken place on both sides of the world and two quite distinct types of car have resulted. In Europe, Team Datsun Europe, under the management of Andy Dawson, has built up a car suited to the sprint type of evens which prevail. In Japan, the Datsun factory team, still watched over by Takashi Wikabayashi, has developed a strong and reliable endurance car, capable of competing on the toughest events in the world. The Datsun ‘Sedan’ Violet bodyshell is familiar enough, since it is also used for the 160J. In fact, the teams still run 160J cars in G2 form as back up cars in most events. Tony Pond drove in Portugal, Jorge Recalde has run cars in South America. If nothing else, the presence of G2 cars helps with World championship points scoring. The block of the Violet GT engine is similar to that used on the 160J, designated the L20B. Its cast iron construction makes it extremely strong, and modified crankshaft and con-rods help with engine reliability. The twin-cam cylinder head is cast in aluminium alloy and two, twin choke Weber carburettors are used. The maximum power output from the GT engine is about 230bhp at 7500rpm, which makes the car only about 20bhp more powerful than the old. single camshaft cars used to be. However, the drivers claim that they particularly notice the effect of the new engine in the higher rev range and in extreme conditions. For instance, Mehta was quite happy to use a G2 car on the Acropolis Rally where speed was not essential, but insisted on a G4 car for the Codasur where the stages wind across the Andes. Recent modifications to the transmission system have included the use of an AP developed ‘paddle' type clutch plate and this was used successfully by both G4 cars on the Tour de Corse. However, reports back from South America suggest that the new parts might have given trouble after there were problems with the release bearings. Apart from that the transmission system not standard, using a Datsun built, five-speed gearbox. Two sets of gear ratios have been developed by Team Datsun Europe for both gravel and tarmac stages. There is a separate set for use on the Safari Rally. A heavy duty lower axle link is one of a number of heavy duty parts designed with the Safari Rally in mind. After problems on the Tour de Corse last year, when the G2 cars were declared illegal because of front suspension modifications, much of the development this year has been in this area. Individual drivers now set their cars up to suit their own driving style. A Dawson car differing quite markedly from a Salonen car. It is perhaps ironic that a rally car which took quite so long to come to fruition should have a short life, but it seems that the Datsun Violet GT will not be with us for long. New regulations come in a force next year. The Japanese like to 'facelift’ their cars at regular intervals. It seems likely that there will be a new Datsun for 1982 — but at least the lessons will have been learnt. 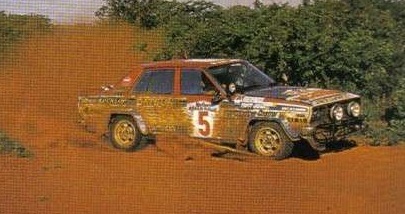 Image 3: Rauno Aaltonen was involved in the stormy Safari finish. 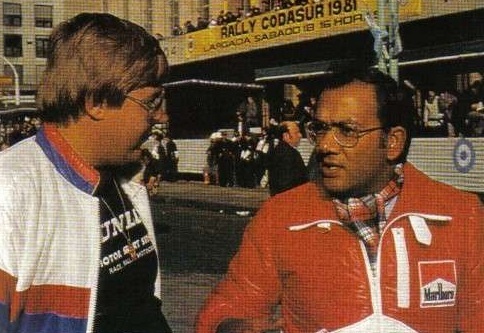 Image 4: Timo Salonen and Shekhar Metha, mainstars of the Datsun team. 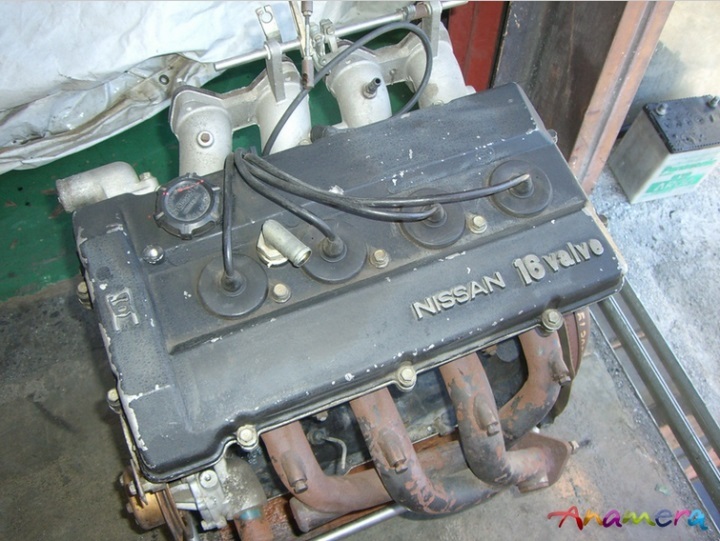 Datsun cast Iron L20B block, 4 cylinders in line, 1975cc, 85.5mm bore 86.0mm stroke, aluminum alloy cylinder head, 16 valves, twin-overhead camshafts, 10.8:1 compression ratio. Two twin choke Weber 48 DCOE carburetors.